Manufactured in Europe for quality and consistency LECA pebbles are a sterile ceramic that will not rot or decay. Their irregular shape "locks in" plant root's quickly. Absorbent, lightweight, non-degradable growing media that outperforms all other potting media. 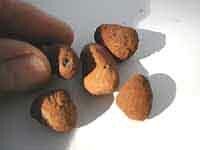 LECA pebbles are made by heating small clay pellets to 2600F. 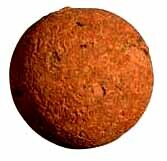 At these temperatures the clay expands, developing tiny air spaces at the core and an extremely hard outer shell. The hard ceramic shell promotes strong capillary action. Moisture is pulled up and absorbed into the hollow core to be by the plant's root system. The smooth outer shell minimizes salt buildup. 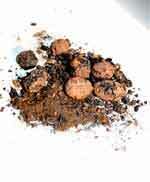 LECA pebbles are a sterile ceramic that will not compact, decompose, or harbor mold or disease. Their irregular shape promotes maximum air circulation at the roots. And strong roots make healthy plants. Tiny air spaces inside each pebble. Hydroton - Hydroton pebbles are round compared to the irregular shape of LECA. Although it has the same basic properties, the round shape makes repotting more tedious. New transplants "lock in" much quicker with LECA. New transplants in Hydroton are very unsteady - think of a pencil standing in a glass of marbles. Lava Rock- A natural product that is dug out of the ground and used "as is". It holds very little water and has no "capillary properties" whatsover. Lava Rock has a solid core with openings (pits) at the surface (just the opposite of LECA). These openings trap unused fertilizer (salts) along with other impurities and cannot be washed away. With its its realively smooth surface, LECA releases unused salts and minerals when fresh water is rinsed through the root system. Lava rock's sharp edges can be also be harmful to the plant's root system. 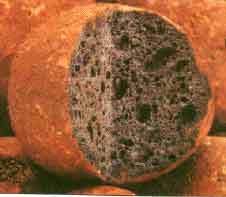 Aliflour-Manufactured using the same process but the clay is not as pure and it is not heated to the same high temperatures of LECA. This makes Aliflour much weaker. Pebbles can be crushed easily and there's always residue at the bottom of the pot from pebbles breaking. Designed to be added to moss and bark mixes for areation.